Before I started working in charity communications, I spent four years teaching English as a foreign language in Prague and London. One of my first classes was full of Czech bankers who gave up their Saturdays to learn English. They were an intermediate-level group, so they could make themselves understood but were far from fluent. They were also one of my favorite classes to teach because every single one of them was enthusiastic and fearless, throwing themselves wholeheartedly into every activity I planned. We spent our Saturdays laughing together. Half-way through the year, their boss (who was paying for their classes) visited to find out what they thought of their teacher. She interrupted my class with no warning and spoke with them in Czech, so I only understood the gist of what was going on. The boss asked them a question; my students smiled at me. “Awesome!” one of them shouted, giving me a big thumbs-up. 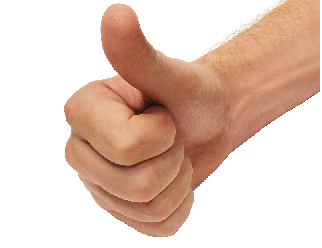 “Yes, she’s totally awesome!” another agreed, also with a thumbs-up. It was the moment I realized I always praised them in the same way. “Awesome answer, Jiri!” “Your pronunciation was totally awesome, Pavel!” Big thumbs-up from Katrina. Yes, I’d just moved to the Czech Republic from Los Angeles. And no, I didn’t claim to be teaching them proper English. These repetitions are usually invisible to me – of course they are, otherwise I wouldn’t let them survive the first edit. But once someone points them out, I see how obvious they are. I’ve found a couple of fun ways to visualize my writing and help me cull repetitious words. First is Savvy Authors’ Autocritter (login required). You have to be a paying member of Savvy Authors to use it, but it’s well worth the money to join this vibrant community of writers. You can paste in a passage (or even your whole novel) and it counts up how many times you use each word, even telling you how many times that word should be used, depending on the number of words in the passage. It then highlights the words in red, making it easier for you to find and change them. Here you can see my results from chapter two of the novel I’m editing. Several of the words I overuse are weak words that should be culled anyway. 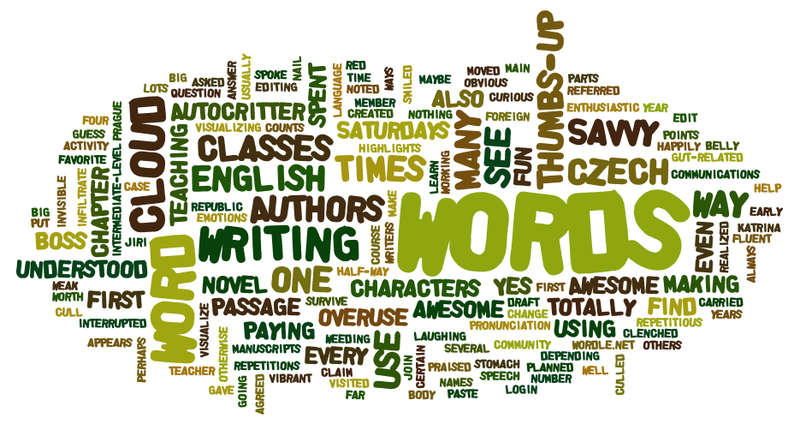 Perhaps a more fun, but less effective, way of visualizing your writing is by making a word cloud. The more frequently you use a word, the bigger it appears. Here’s a cloud I created using the same chapter that I put in the Savvy Authors’ Autocritter, this time using Wordle.net. Can you guess my main characters’ names? What words do you overuse? Do you have any tips or tools for weeding them out of your writing? Interview with Roxanne St. Claire – & giveaway! What a great post! I never thought of using Wordle, and Savvy Authors looks like it’s well worth exploring. Thanks! And thanks to Shannyn Schroeder, whose mash-up pointed me this way. Jennifer Jensen (@jenjensen2) recently posted..Can a Writer’s Blog Really Help You Get an Agent? Thanks to you and Shannyn both! Savvy Authors is definitely worth exploring. I’d say that tool alone is worth the membership fee – and there’s so much more than that going on. Hope I see you there – or here again!